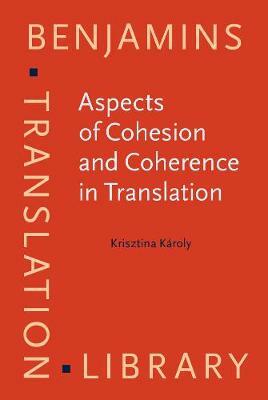 This book deals with the (re)production of cohesion and coherence in translation. Building on the theories and methods of Translation Studies and Discourse Analysis it answers some basic, still much debated questions related to translational discourse production. Such a question is whether it is possible to analyse the (re)production of coherence, and if yes, how? Can the models devised for the study of English original (not translated) and independent texts (unlike translations and their sources) be applied for the analysis of translation? How do cohesive, rhetorical and generic structure "behave" in translation? How do particular components of coherence relate to translation universals? The volume proposes a complex translational discourse analysis model and presents findings that bring new insights primarily for the study of news translation, translation strategies and translation universals. It is recommended for translation researchers, discourse analysts, practicing translators, as well as professionals and students involved in translator training.